Dr. Sciurba's long term research interest includes volume reduction strategies in patients with advanced emphysema and the use of exercise testing as a diagnostic and outcome tool in lung disease. 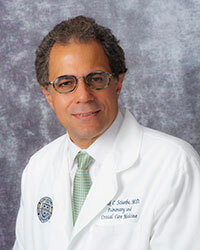 Among his research interests and published work includes assessment of new concepts related to patterns of pulmonary and systemic inflammation associated with COPD, the impact of therapy on dynamic hyperinflation, the role of quantitative imaging in the assessment and reclassification of COPD, the design of the VENT endobronchial valve trial and role of valves in relieving native lung hyperinflation following lung transplantation, the retinoic acid FORTE trial, gender differences in COPD, assessment of methodology of pulmonary exercise testing and activity monitoring in COPD, and the important role of autoimmunity in the progression of COPD. Dr. Sciurba's clinical focus is on advanced or difficult to manage patients with chronic obstructive pulmonary disease (COPD) including emphysema. Dr. Sciurba, with colleagues at the University of Pittsburgh, have extensive experience in evaluating patients for lung volume reduction surgery. In addition, consideration for enrollment in bronchoscopic volume reduction or other novel, pharmacologic, or biologic clinical trials considered for patients whose options are limited. Dr. Sciurba's clinical and research philosophy revolves around the fact that all patients have a unique manifestation of the disease commonly known as COPD and thus may require a unique therapeutic regimen, specific to their own situation. Sciurba, FC, Criner, GJ, Strange, C, Shah, PL, Michaud, G, Connolly, Ta, Deslee, G, Tillis, WP, Delage, A, Marquette, CH, Krishna, G, Kalhan, R, Ferguson, JS, Jantz, M, Maldonado, F, Group RSR. Effect of endobronchial coils vs usual care on exercise tolerance in patients with severe emphysema: The Renew randomized clinical trial. JAMA. 2016; 315(20): 2178-2189. Sciurba, FC, Chandra, D, Bon, J. Bronchoscopic lung volume reduction in COPD: Lessons in implementing clinically based precision medicine. JAMA. 2016; 315(2): 139-141. Sciurba, F, Rennard, SI. Rationale for a redundant formulary. The Hawthorne effect and the art of medicine. Am J Respir Crit Care Med. 2015; 191(11): 1224-1225. Criner, GJ, Connett, JE, Aaron, SD, Albert, RK, Bailey, WC, Casaburi, R, Cooper, JAD Jr, Curtis, JL, Dransfield, MT, Han, MK, Make, B, Marchetti, N, Martinez, FJ, Niewoehner, DE, Scanlon, PD, Sciurba, FC, Scharf, SM, Sin, DD, et al, for the COPD Clinical Research Network and the Canadian Institutes of Health Research. Simvastatin for the prevention of exacerbations in moderate-to-severe COPD. N Engl J Med. 2014; 370: 2201-2210. Bon, J, Liao, S, Tseng, G, Sciurba, FC. Considerations and pitfalls in phenotyping and reclassification of chronic obstructive pulmonary disease. Transl Res. 2013; 162(4): 252-57. Chandra, D, Wise, RA, Kulkarni, HS, Benzo, RP, Criner, G, Make, B, Slivka, WA, Ries, AL, Reilly, JJ, Martinez, FJ, Sciurba, FC, for the NETT Research Group. Optimizing the six minute walk test as a measure of exercise capacity in COPD. Chest. 2012; 142(6): 1545-52. Bon, J, Fuhrman, CR, Weissfeld, JL, Duncan, SR, Branch, RA, Chang, CCH, Zhang, Y, Leader, JK, Greenspan, SL, Sciurba, FC. Radiographic emphysema predicts low bone mineral density in a tobacco exposed cohort. Am J Respir Crit Care Med. 2011; 183(7): 885-90. Sciurba, FC, Ernst, A, Hearth, FJF, Strange, C, Criner, GJ, Marquette, CH, Kovitz, KL, Chiacchierini, RP, Goldin, J, McLennan, G, for the VENT Study Research Group. A randomized study of endobronchial valves for advanced emphysema. N Engl J Med. 2010; 363(13): 1233-44. Hogg, JC, Chu, F, Utokaparch, S, Woods, R, Elliott, WM, Buzatu, L, Cherniack, RM, Rogers, RM, Sciurba, FC, Coxson, HO, Pare, PD. The nature of small-airway obstruction in chronic obstructive pulmonary disease. N Eng J Med. 2004; 350(26): 2645-2653. Sciurba, FC, Rogers, RM, Keenan, RJ, Slivka, WA, Gorscan, J, Ferson, PF, Holbert, JM, Brown, M, Landreneau, RJ. Improvement in pulmonary function and elastic recoil after lung reduction surgery for diffuse emphysema. N Engl J Med. 1996; 334(17): 1095-1099.